1. Be assertive. Do not be agressive, do not be passive. You have to sound like you know what you’re talking about so the customer does not try to break you, but you also should come off as almost apologetic and open minded to whatever issue the customer is having so they can feel like there will be a resolution. Basically just be kind, be confident, listen to what they have to say, stay in control and always be professional. 2. Speak more slowly. Speaking to the customer slowly will help you think more clear and remain calm. You maintain your poise during difficult situations, such as dealing with an upset customer, by speaking slowly and methodically. 3. Wait a moment before responding. Chances are you’ll end up saying something you’ll later regret if you react immediately to something an upset customer is saying. Think about the best response and the best approach while taking a deep breath before saying anything. This is definitely a situation where you’ll want to think before you speak. 4. Take a time-out. An upset customer is the ultimate emotional trigger. They have a special way of getting you rowled up. Before reacting without thinking, and potentially losing your job, just take a break. Tell the customer you’ll get a manager or assess the situation and just walk away. The point of this is to be able to re-group so feed them any excuse you have to in order to collect yourself. 5. Use positive self-talk. Instead of reminding yourself that you don’t get paid enough to deal with that kind of customer, tell yourself that the customer really needs your assistance. They need your assistance so bad that they are causing a scene. If you think more positive you’re likely to respond positively to the customer. The only thing that will come of negative thoughts are negative words and no one wants that. 6. Show your power before you use it. When customers get argumentative they usually wants to speak to the person in charge. If you let them know that person is you early on, this may keep the customer from getting too heated and escalating the situation. 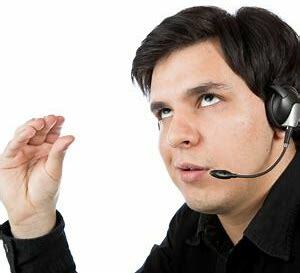 Instead of saying, “Get out of my store!”, you can say, “I want to help you but I need you to lower your voice.” They’ll probably be more open to finding a resolution with you. Plus, it shows your power and your message gets across. Whereas, telling your customer to leave the premises uses up all of your ammunition and probably won’t diffuse an irate customer. These six really simple tips will assist in helping you maintain your posture when customers get heated.